MBE-awarded, multi music-award-winning, influential English folk singer and guitarist. Amongst his musical collaborators are The Watersons, Steeleye Span and Dave Swarbrick. 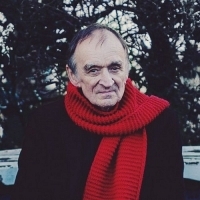 His discography since 1965 includes several duet albums with Swarbrick such as "Byker Hill" and "Life and Limb" as well as solo albums, "Landfall" and "Shearwater". He has also released several albums with The Watersons (as Waterson:Carthy) including "Common Tongue" and "Holy Heathens and the Old Green Man".